2-in/5-out high-end USB audio interface for the guitarist. If you are a guitarist who is looking for a reasonably priced audio interface that is oriented primarily toward the guitarist, consider the AXE I/O. 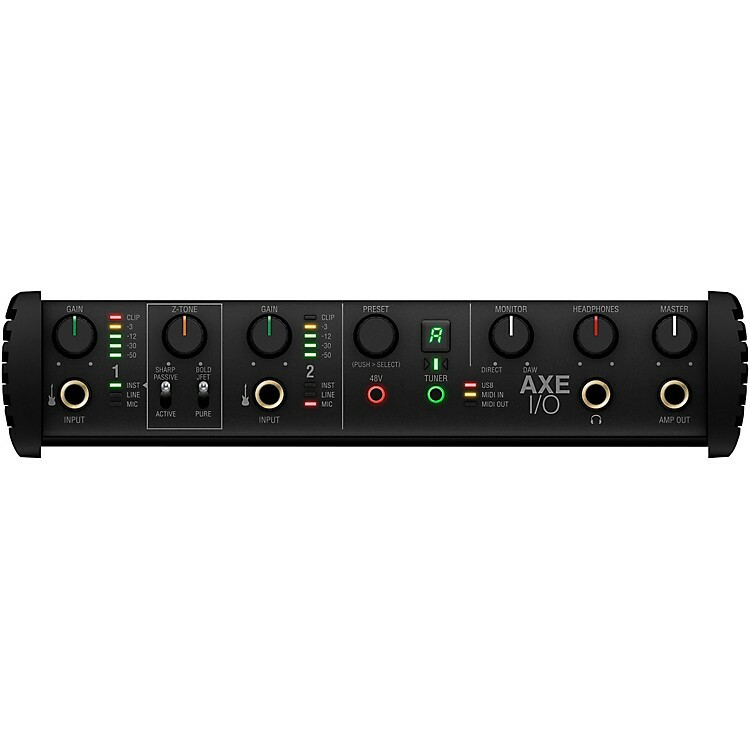 The AXE I/O is a premium audio interface with comprehensive inputs, outputs and controls. It features a front-panel 1/4” Hi-Z in and Amp out, two combo inputs for instruments and mics (with +48v phantom power), and four TRS balanced line outputs. The system can process two inputs and five outputs simultaneously along with MIDI I/O data. It has two configurable inputs for pedals and/or switches, along with input gain control, LED signal indicators, and monitor, master and headphone volume controls. Its unique PURE circuit delivers completely transparent and ultra-accurate sound with >117 dB (A) dynamic range. JFET adds subtle harmonic enhancement for a rounder, warmer sound without sacrificing dynamic range, and ACTIVE bypasses unneeded stages for completely transparent sound when used with active pickups. The patent-pending Z-Tone variable impedance Hi-Z input re-shapes the tone of your guitar, or it can precisely match the impedance of a virtual gear model. The AXE I/O’s front-panel Amp output for easy re-amping, with no need for a direct box and no ground loops or noise. A front-panel 1/4” return lets you add external pedal FX without the need to rewire rear inputs. It has a built-in tuner to keep your instrument in tune throughout recording sessions, and a PRESET control to change settings in AmpliTube 4 and other plug-ins, with two freely assignable CC inputs for expression pedals or single/switches for real-time control over virtual rigs. High-end sound meets best-in-class guitar tone. Order today.